LOS ANGELES — As wildfires rage these days in southern California, burning glitzy towns like Malibu, the roster of evacuees reads like the guest list at the Oscars. 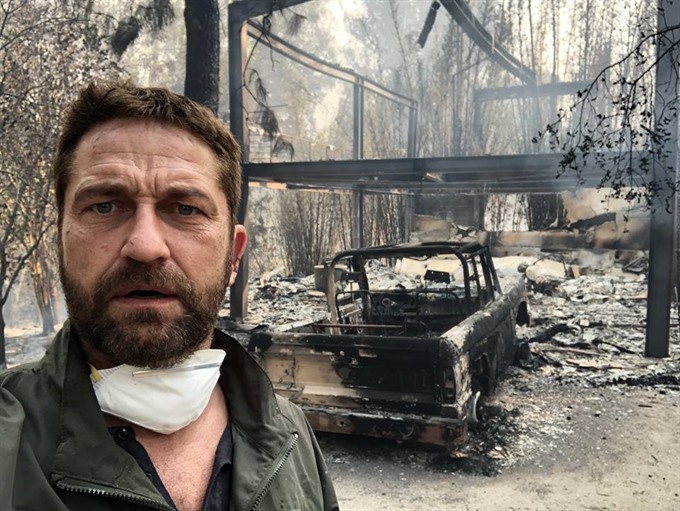 These celebrities have taken abundantly to social media to post photos or videos of themselves being safe and sound (Kim Kardashian) or looking at what’s left of their gutted home (Gerard Butler). While the so-called Camp Fire in the north has exacted a devastating human toll of 42 lives so far and essentially erased the town of Paradise, down south the flames have killed two people whose bodies were found in a car. They have charred 93,000 acres (38,000 hectares) of land, almost as much as the fire up north. But the Woolsey Fire has hardly spared Hollywood’s beautiful people either, at least in material ways. News reports said the wildfire has threatened the homes of many celebrities, including Guillermo del Toro, Alyssa Milano, Will Smith, James Woods, Orlando Bloom, Melissa Etheridge, Cher and Pink. Miley Cyrus tweeted Monday that a multimillion dollar Malibu mansion that she bought with fiance Liam Hemsworth is no more. "Completely devestated (sic) by the fires affecting my community. I am one of the lucky ones," the singer and actress tweeted. "My animals and LOVE OF MY LIFE made it out safely & that’s all that matters right now. My house no longer stands but the memories shared with family & friends stand strong. I am grateful for all I have left," Cyrus added. Kardashian said she was forced to flee the home she shares with singer husband Kanye West in the town of Calabasas and said the fire later reached the property. Kardashian said she had just returned from a trip and had only an hour to pack up and evacuate. Later, she posted a black and white photo of herself with True, the daughter of her sister Khloe. "Trying to get my mind off of this fire and snuggling with my niece. We are all safe and that’s all that matters," she wrote on Instagram. Lady Gaga posted photos of huge, dark billowing clouds of smoke over her neighbourhood as she prepared to evacuate, along with a video of herself packing.